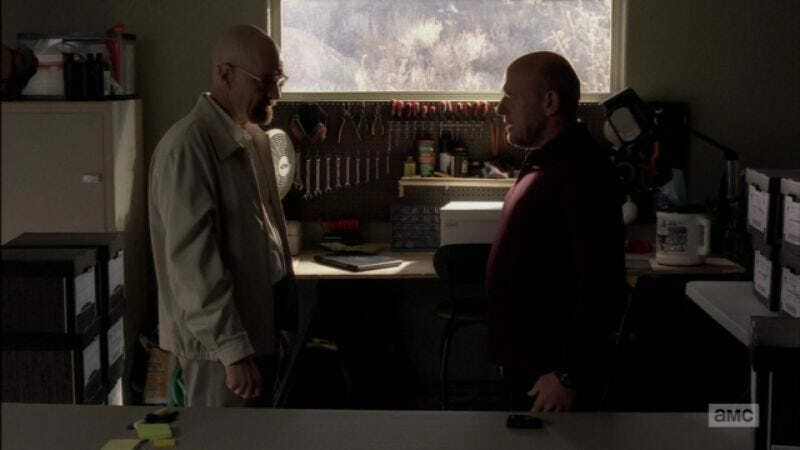 The conclusion of Breaking Bad’s fifth-season episode “Blood Money,” in which Hank Schrader confronts his brother-in-law Walter White with his knowledge of Walt’s criminal actions, is in some ways the emotional climax of the entire show. In a few moments, years worth of tension and deception are blown away as Hank unleashes his anger at Walt’s myriad betrayals in a flurry of aggression and rage. But hey, you know what’s funnier than regular old aggression? Passive aggression. And thus, this idiotic, juvenile, repeatedly giggle-inducing re-cut of the scene by YouTube user Frank Fenimore, in which Hank manages to take out some of his anger on Walt in the most immature way possible.